Tropic Thunder (2008) – Get Some! Tropic Thunder starts off in your face, and spends the next two hours blaring and honking, tooting and parping, like the world’s biggest, most expensive, attention seeking one man band. The man with the cymbals and the washboard is Ben Stiller, and he plays his assorted instruments as loudly and enthusiastically as possible. 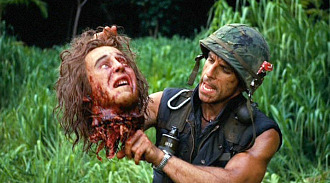 Tropic Thunder is never less than entertaining. The jokes are obvious, the music choices are cliched, and the satire is broad, but Tropic Thunder also possesses a manic energy, powered by three monstrous comic performances. Robert Downey Jr picked up the plaudits and the nominations, but Tom Cruise’s demented turn as a brimstone-spitting movie mogul is just as memorable. Stiller deserves credit for starting off offensive and having the courage to stick with it, and mounting a Hollywood satire with a Hollywood blockbuster budget. Satires about the movie making industry are ten a penny, but few come with a $90 million price tag. Tropic Thunder follows the disastrous adaptation of an acclaimed memoir by a Vietnam Vet, “Four Leaf” Tayback (Nick Nolte), who lost his hands saving his comrades in battle. The bloated production is stuffed with assorted Hollywood types. There is the over-the-hill action star, Tugg Speedman (Stiller), sniffing out another hit after his creaking franchise, Scorcher, left audiences cold, and his ill-advised stab at credibility, Simple Jack, is regarded as the worst film ever made. Also onboard and striving for credibility is Jeff Portnoy (Jack Black), a drug addicted bad boy famous for a string of fart-based comedies; and rapper Alpa Chino (Brandon T Jackson), fresh from a lucrative endorsement of “Booty Sweat” energy drink and trying to go legit in the movies. Contrasting sharply with Speedman and the others is Kirk Lazarus, five time Academy Award winner, an actor so method he undergoes surgery to darken his skin to portray African American Sgt. Lincoln Osiris. So method, in fact, he stays in character all the time and doesn’t emerge until after he’s done the commentary on the DVD. The warring egos cause trouble on the location shoot, and rookie director Damien Cockburn (Steve Coogan) is unable to control his cast. The chaos on set causes the cameras to miss a $4 million explosion, attracting the attention of the movie media, reporting the production as over budget and a month over schedule after only five days. Studio Boss Les Grossman (Tom Cruise) is furious, and threatens to pull the plug unless Cockburn can control his stars. Cockburn follows Four Leaf’s suggestion, dropping the prima donnas in the middle of the jungle and rigging cameras along their route, and use pyrotechnics to elicit a realistic performance. The idea of pampered actors finding themselves in peril without realizing it isn’t exactly original – Three Amigos! and Galaxy Quest – and Tropic Thunder, seemingly conscious of this, takes a little while to get rolling. Stiller seems to try covering up the unoriginality with a lot of shouting, noise and swearing. Once the gang finally realize they’re in trouble the film finds the right gear. The cast warm to their characters and Tropic Thunder actually becomes an effective action movie in its own right, as Lazarus and the remaining actors break into the cartel’s base to rescue the others. The satire is broad, but packs a mighty punch. The film attracted the wrath of disability advocacy groups in the States, objecting to the repeated use of the word “Retard”. In one of the film’s most memorable moments of dialogue, Lazarus explains to Speedman the fatal mistake he made in Simple Jack, of going “Full Retard”. Eyebrows were inevitably raised about Downey Jr’s character going “Blackface”, but once again, the joke is not on black people. The joke is on a character so shameless and so wrapped up in “Method” methodology he believes that he can be Black by being black. Downey Jr’s jive talking Lazarus/Osiris is the film’s outstanding performance, as layered as it is. What is happening in Lazarus’ head? He is so in character, he doesn’t back down from racial stereotypes even when called by the real African-American on set. Downey Jr is almost trumped by Tom Cruise’s grotesque cameo as Les Grossmann. Demonic studio bosses have been done many times before, but you have to think back to Michael Lerner in Barton Fink to find one this fickle, ferocious and slimy. Who knew Tom Cruise had a sense of humour? Stiller, who has made a career of portraying angry little men with huge egos, is more likeable here than he has been for quite a few years now, and generously lets Downey Jr grab all the plaudits with the flashier role. Stiller puts in some good work here though, and draws considerable sympathy. And of course, there’s his deliberately excruciating moments as Simple Jack. Of the cast’s big names, Jack Black is the most disappointing. His Portnoy is a jarringly one note, mean-spirited performance, as the meaty wild child spends the whole movie screaming and shouting through cold turkey in the jungle. Nick Nolte is predictably gruff and grizzled as Four Leaf, the vietnam vet whose experience of the war may not have been as grueling as he described in his book. In a neat cameo, Matthew McConaughey is convincingly slick as Speedman’s shallow, materialistic but ultimately loyal agent, Rick Peck. The film has the look and feel of a glossy Hollywood blockbuster, although some of the music choices are rather familiar. This may be a deliberate choice – if movies have taught us anything, it’s that guys riding in helicopters loved listening to the Rolling Stones & Buffalo Springfield while machine-gunning “gooks”. Tropic Thunder is worth catching on the small screen for some tasty comic performances and some juicy, controversy-baiting dialogue. Sure to develop a separate cult following away from the big screen. Posted on 15/05/2012, in Comedy, Film, Movies, T, War and tagged Ben Stiller, Jack Black, Robert Downey Jr, Tom Cruise, Vietnam. Bookmark the permalink. 5 Comments. It’s very straightforward to find out any topic on web as compared to textbooks, as I found this paragraph at this site.